This interchangeable hammer is an incredible deal! Why buy each hammer individually when you can have twelve in one? Smooth Faces: Nylon Face Flat Nylon Face Domed Flat Stainless Steel Domed Stainless Steel Flat Brass Domed Brass Textured Faces: Stripes Weave Thin Circles Wide Circles Speckles Dots Nylon handle with special designed head that allows the use of interchangeable faces. 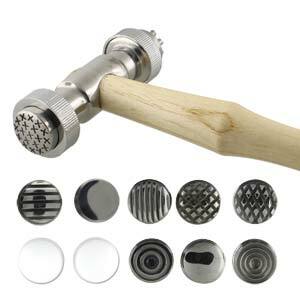 Comes with tool specifically designed so that you can easily un-screw and change out the faces on the hammer. Measurements: Each Face is 7/8 Inch (Apx. 21.6mm). Hammer is 9.5 Inches Long. Total weight of all pieces approximately 24 oz. Quantity: 1 Hammer with 12 Interchangeable Faces Included CAUTION: Always wear proper face and eye protection when using tools.